"I MISS MY MOM," SAYS PENGUIN. Mom has announced that she is going out. Mom picks up her bag and announces that someone has come to stay and play with Penguin until she comes back. She waves cheerily from the door.
" BE GOOD! HAVE FUN!" Penguin is not exactly feeling the fun. He hugs his comfort cushion and sheds a few tears, but when Mrs. Duck puts her wing around him and reads him a story book, he listens quietly and sadly. Still morose, he colors with her, but when she shows him how to build a tower of blocks, he begins to get into the spirit of the fun. And when Mrs. Duck puts out quite a spread for their snack, Penguin perks up. Yummy! And then Mom comes through that door with a big smile and open arms. But Penguin is too busy snacking on his goldfish crackers to stop right away for the big hug. It's a good guess that Mrs. 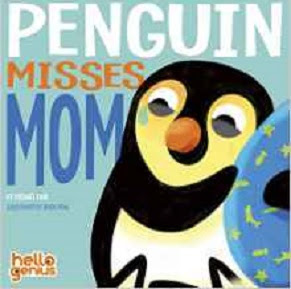 Duck will be making a return engagement as the sitter with the mostest, in Michael Dahl's forthcoming Penguin Misses Mom (Hello Genius) (Picture Window/Capstone Books, 2016). Oriol Vidal's artwork pictures an adorable little penguin coping pretty well with his mom's day out. With bright page backgrounds and simple illustrations in contrasting flat color that pop off the page, these Little Genius board books are charming introductions to the experiences with which young kids must cope. Pair this one with Anna Dewdney's popular hit, Llama Llama Misses Mama. Other books in the Hello Genius series are Dahl's Little Tiger Picks Up (Hello Genius), Little Lion Shares (Hello Genius), and Little Monkey Calms Down (Hello Genius).